This spectacular first floor golf villa located in Bear Trap Dunes is just a short walk away from all pools and the community center and is perfect for two couples or a family. This spacious (more than 1,400 square feet) villa features luxury decor, brand new carpeting, furnishings and amenities throughout, spacious living room, dining room and kitchen, two bedrooms (queen bed in master bedroom, two twins in second bedroom) and queen sleeper sofa. The fully equipped kitchen makes dining-in easy. If grilling is your specialty, enjoy barbecuing out back and serve dinner on the screened in porch, while enjoying the panoramic views and breezes. For the golfers: Bear Trap Dunes, a Four Star 27-Hole Championship Golf Course featured in Golf Digest, has been voted best golf course at the beach and was named one of 'America's Best Golf Courses' by Golf Week magazine. It boasts a luxury clubhouse with practice range, chipping area and putting green. After a round of golf, you can enjoy drinks at the bar or dining in the golf clubhouse. Golf packages available year round. For the family: Bear Trap Dunes has a great family feeling. The Bear Trap Village Pavilion, two outdoor pools, indoor pool, hot tub, saunas, tennis courts, state-of-the-art fitness center, basketball court, ping pong table, foosball table and playground are all within a short walk from our villa. A free shuttle service to Bethany Beach (approximately two miles away) runs from 8 am to 8pm every half hour in season, and the shuttle stop is only a few steps from our villa - no need to worry about beach parking and paying those meters! Located in an area known as 'The Quiet Resort' you can enjoy the best of both worlds... a relaxing and private retreat that is close to everything! You are only minutes away from beautiful Bethany Beach with its boardwalk, restaurants and shops; the excitement of Ocean City, Maryland with its alluring night life; and, the wonderful tax-free outlet and ecclectice shopping in Rehoboth! Please use the inquiry button below to e-mail us or feel free to contact us at the telephone numbers provided below. For hygiene reasons, please bring your own linens and towels. Prime location, close to all pools and community center, screened-in porch, upscale furnishings, wireless internet access in unit. HOA requires purchase of passes to use community amenities. Details at community center. Just be aware there are no paper towels, toilet paper, towels, bedding, etc. Otherwise it was an affordable, convenient stay for us. Thank you! Only slept there. Did not get to enjoy fireplace, gas grill, or screened in porch. Very apparent that a "detailed cleaning" was not performed between renters. Floors needed vacuumed, crumbs on tables and sofa, master bedroom had bed pillows on the floor, table lamps and furniture dusty, toothpaste on sink, hair on floor and in bathtubs, windows full of fingerprints,kitchen appliances needed cleaned, we only used the refrigerator, no garbage bags in cans and they need a cleaning, some of the ceiling fans were left on, and entry way needed swept. Some of the shades in rooms are not working and need repair. Now after sharing all of this, we cleaned, settled in, and for the short amount of time we were there it was quiet, nice, roomy,and located in a very well kept development. Was not advised of this at all. I have a company that arranges cleaning after every stay. I will be speaking to the company. Ok, if you don't expect more than bare bone basics. Bring all your own amenities.. TP. No phone service in area, could not figure out wi-fi and small screen, analog TV. Showers are for very small, short people. Screened in porch area was filthy dirty. 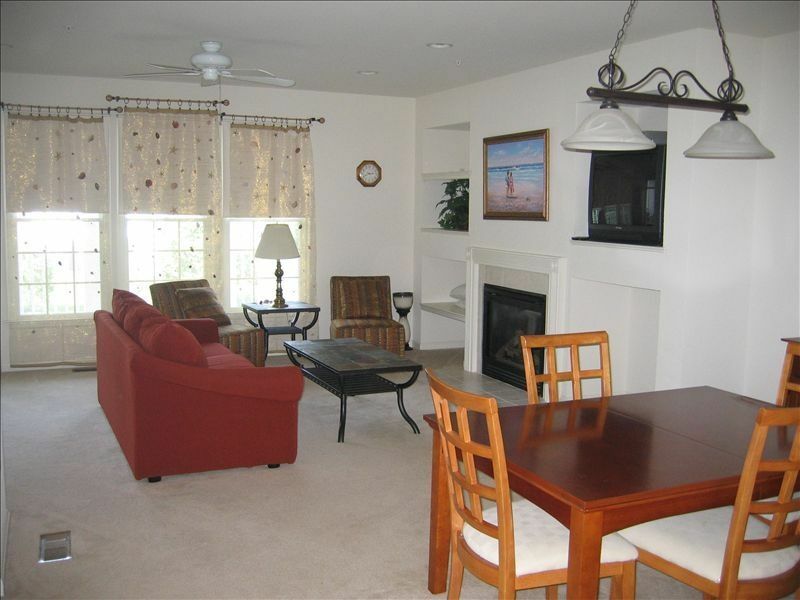 Unit is in nice community, easy to get to Bethany Beach. Rest of unit was clean and had all the basics. Only stayed for one night so we made due. Sorry to hear this. Because this is not a hotel, you do need to bring your own TP, soap, etc. I have not heard of any problems with phone service. All you had to do was call either my maintenance company or me to "figure out" wi-fi and small TV and have screened in porch cleaned. Instructions were sent with check-in instructions. Showers are normal size, just not extra large. Great place! The owner was so accommodating to my needs and very responsive. Would love to stay here again!!! Highly recommend. New Coffee maker was purchased as soon as we were notified that there was an issue. Glad the unit worked well.